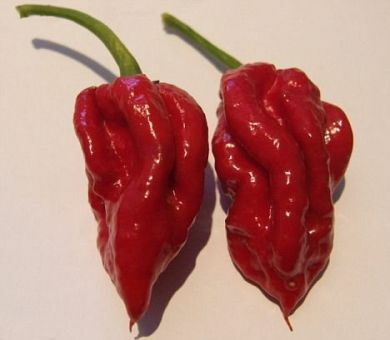 The Ghost Chile (aka Ghost Pepper Pods) is so named for its "ghostly" bite. It is known as one of the hottest chile peppers. This pepper is reserved for those who wish to add true fire to their dishes. This pure ghost chile powder is made from ground dried ghost chilies, nothing else. As such, it is one of the hottest chili powders known to man. Each pound of powder has been ground from approximately 150 ghost chiles. Our Ghost Pepper pods & peppers rate approximately 900,000 Scoville Heat Units tested by HPLC (High Performance Liquid Chromatography). Our Ghost peppers are 100% grown in the Naga region of India.Home of the Worlds Hottest Pepper. Ghost pepper pods are hotter than anything available online, theGhost Pepper from India taste better and are 100% satisfaction guaranteed. Each and every Ghost pepper pod is hand-picked, de-seeded by hand, and is pampered from seeds to fruit. The Ghost Pepper Pods (Capsicum chinense) or Ghost Chile, named for its ghostly bite, is the hottest chile pepper in the world. Also known as the Naga Jolokia and Bih Jolokia, or poison chile pepper, it has been measured at 855,000 Scoville units up to 1,041,427 units by an Indian export company. The Bhut Jolokia Pod is twice as hot as the Red Savina (350,000-577,000 Scoville units) and is similar looking to the Dorset Naga. When ripe, the ghost chiles are 60 mm to 85 mm long and up to 30 mm wide. They have an orange or red color. They are very similar looking to Habanero peppers, but they have a rugged skin. Ghost Pepper Pods & Ghost Chiles are very, very, very hot Use them sparingly, add a little to fresh salsa, sauces, chili and anything else you want to start a 12 alarm fire with. Ghost Pepper Pods & Dried Ghost Chiles (Caution: World's Hottest Ghost Chili. Handle with care, do not get in eyes. Flush with water to relieve symptoms). Caution: Ghost Pepper Pods World's Hottest Chili. Handle with care, do not get in eyes. Flush with water to relieve symptoms.Rinse product first with warm water. soak in hot water for 10 minutes to rehydrate or add directly to recipe that will cook at least 10 minutes. Once rehydrated, dice or puree and add to a recipe.